If there is a big box of Lego bricks and there are two kids, there is also an endless litter of Lego all over the house. One of my main daily activities from morning until night time is picking these bricks up from the floor, from the furniture, from the bathroom sink, lying down on them on our bed, sitting on them on our couches and extracting them from the pockets of freshly-washed clothes of my kids. There's no escape. They are everywhere! One of the worst noises that I dread and hate is a box of thousands of Lego bricks falling on the floor. When it happens, I want to run away because it means that when I will walk in the room, I will not see the floor anymore and that we (me 90% and the kids 10%) will pick the bricks up one by one. Sometimes I suspect that the kids enjoy "accidentally dropping" the box because from the point of view of someone who doesn't need to pick them up, it can be fun to have them all over the floor. Inspite of my Lego predicament, I got something wonderful out of it. Because of looking at those colored bricks everyday for so many years, something clicked and I was able to use in in my cooking. 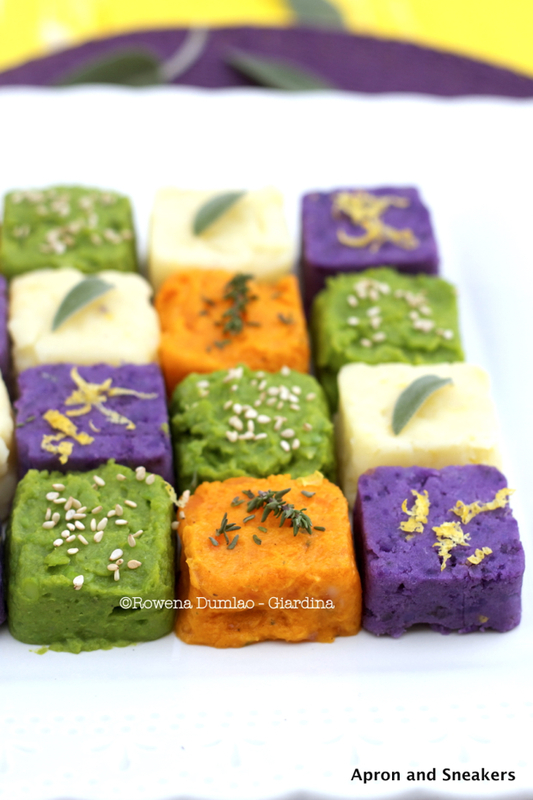 Here is my plate of Vegetable Purée Cubes, inspired totally and completely from my Lego adventures and misadventures. I couldn't help feeling giddy when I was assembling this. And I couldn't erase the stupid smile I had on my face when I was photographing it. I love it and I hope you do too! 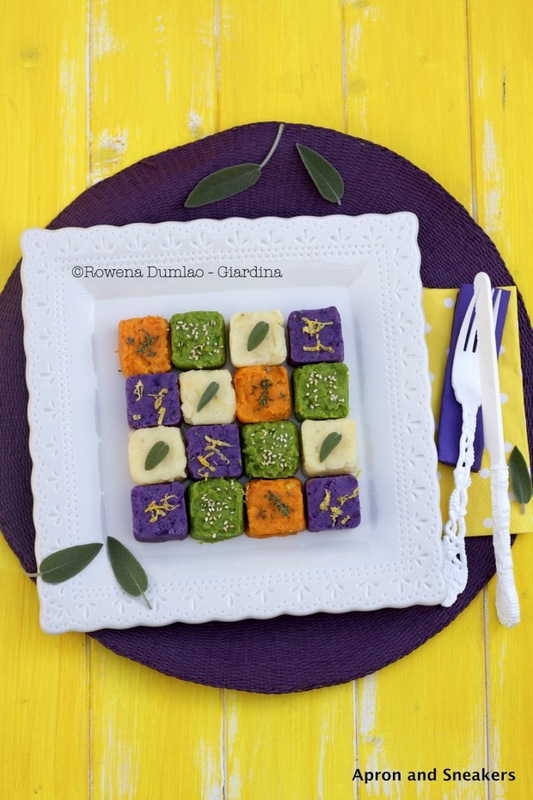 Buon appetito and have a great weekend! Bring a pot of salted water to a boil. Add carrots & potatoes and cook for about 20 minutes or until tender but still firm. Drain. 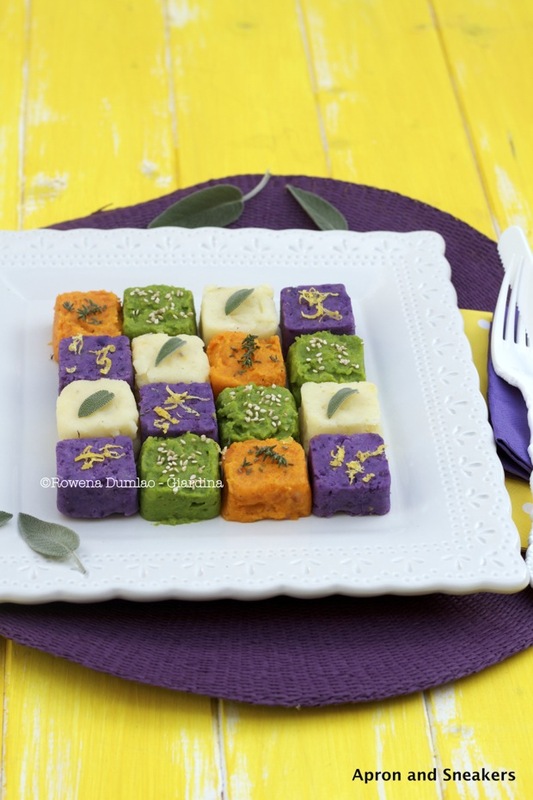 Separate carrots, violet potatoes & yellow potatoes in individual bowls. In another smaller pot, bring salted water to a boil. Add peas and cook for about 10 minutes. Drain. Carrot Purée - Transfer carrots to a food processor or mash with a masher, potato ricer or fork. Add thyme (leaves only), salt & pepper. Purée until smooth. Put in a small saucepan on low fire to dry up the purée. Turn off fire. Add parmigiano reggiano. Set aside. Pea Purée - Transfer peas to a food processor. Add sage, sugar, salt & pepper. Purée until smooth. Put in a small saucepan on low fire to dry up the purée. Turn off fire. Add butter and parmigiano reggiano. Set aside. Yellow Potato Purée - Mash potatoes with potato ricer, masher or fork. Add butter, milk, nutmeg, salt & pepper. Mix well. 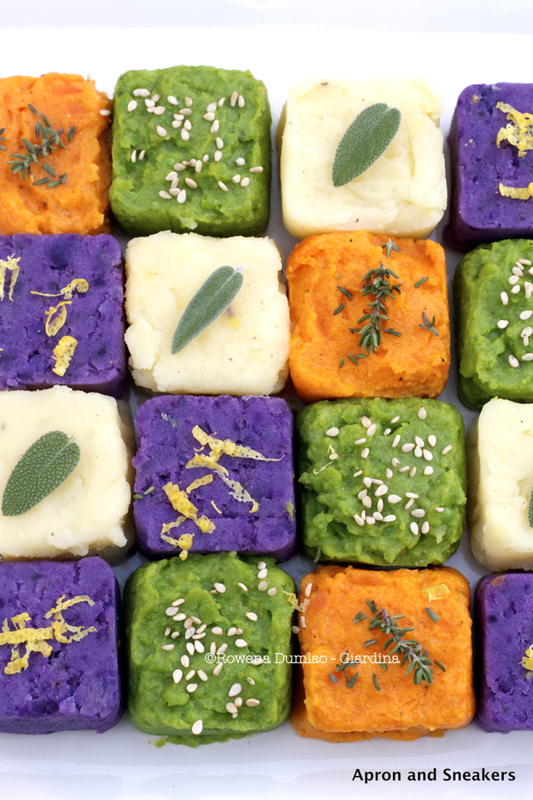 Violet Potato Purée - Mash potatoes with potato ricer, masher or fork. Add butter, milk, lemon zest, salt & pepper. Mix well. In the serving plate itself, position square mold (I used a small square cookie cutter) and fill up with different kinds of purée alternately. Rinse & dry mold everytime you change vegetables to make the cubes clean. Potatoes are easy to shape. Carrots and peas tend to be a bit softer and harder to shape. If this happens, add more parmigiano reggiano. 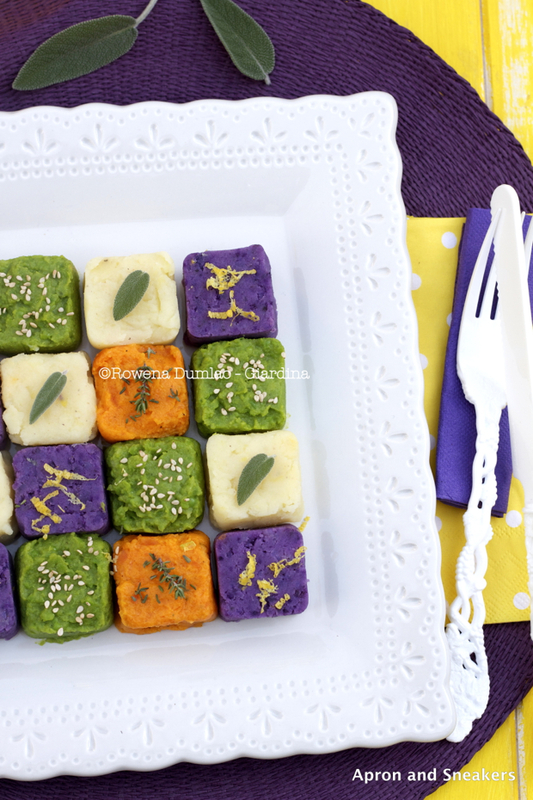 When all the cubes are positioned on the plate, sprinkle peas with white sesame seeds, carrots with thyme, violet potatoes with lemon zest and yellow potatoes with sage. You can substitute with other ingredients that you have at the moment.